I bought three of these blanks months ago, and forgot to write up a post about the one I actually got finished (link to finished project). So for anyone interested, I'll just start with how I got them. 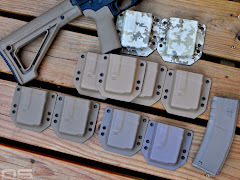 I contacted Outdoor Dynamics through their website and asked about the "Ray Mears" style Parang blanks. 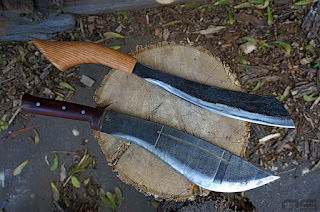 Now, my understanding is that Ray Mears likes the style of Parang common to this particular area of Malaysia and they just call them that for people interested in that specific style. I don't think Ray Mears has anything to do with their creation or marketing or anything else. I think that perhaps the style is common to Bidor, but honestly, I have no idea. In any case, that is where they are made and where they came from to get to me. 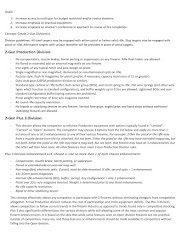 At the time, and this might still be the case, there was no US distributor, and what's more, they told me that they are going to stop offering blanks. So, shipping ends up costing more than the blanks, and to make it come out reasonable, I ordered three. To pin or not to pin, that is the question. Unpinned handles, from what I can gather, are a common occurrence in the jungles where Parangs originate. And probably so are pinned handles. These Parangs have a short, but wide and pointed tang. 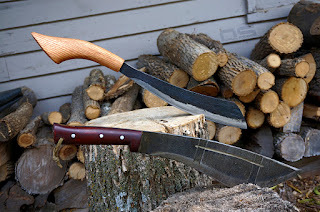 They typically heat the tang and "burn in" the handle, essentially using the hot tang to melt a plastic handle or burn a wooden handle into place. Many are held by friction alone, others are glued and still others are pinned. 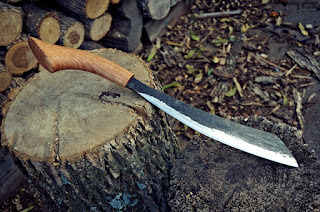 I burned the handle onto mine by wrapping the blade with a water soaked rag and heating the tang with a torch, then forcefully pressing the handle on until it was where it needed to be. There was lots of smoke and hissing but in the end it makes for a perfect fit and is honestly quite satisfying. I then filled it with epoxy and in an attempt to learn something, I have done nothing else to secure it while I put it to use. Ultimately, there is probably no reason not to go ahead and pin the handle, except that in the world of primitive tools, a field repair is worth consideration. If the handle were to be damaged or loose then the pin could just cause more problems than it actually solves. I guess that has to be weighed against the likelihood of being in a situation where I am fully relying on the Parang, and can't just take it home to fix it in the shop. Eh, probably not likely, and I could probably just get away with wrapping the handle in something temporarily. 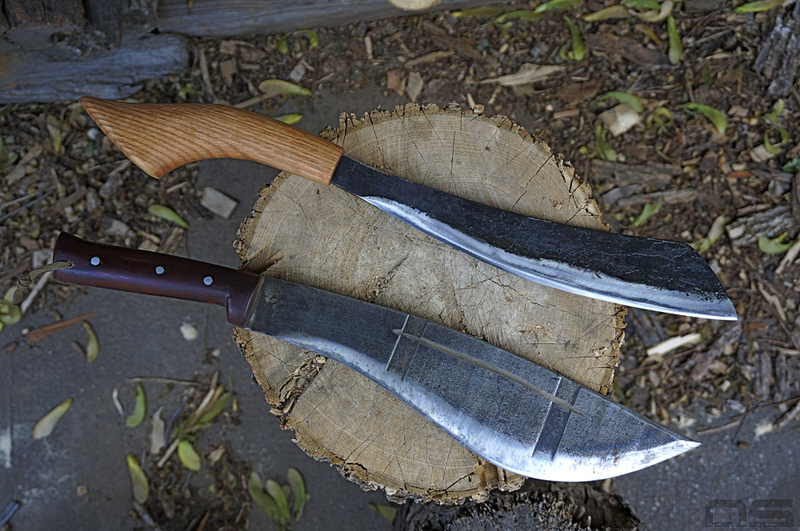 Either way, I have had an opportunity to do some real bush whacking recently and put the Bidor Parang to the test. It's a long story, but I needed to cut a couple paths through some thick brush, tall grass, sapling trees and woody shrub-like bushes. This is Parang territory. They are short machetes for the most part. I quickly learned the trick to the Parang when put up against human-hight grass, weeds, and sapling sized wood. You cannot fist-grip the Parang and use arm power to cut, especially grasses. It will just knock the grass over, which is fine, but it was so thick where I was cutting that if you didn't cut the brush down, you couldn't take another step. Each swing cleared one step and the material had to be moved out of the way to continue ahead. However, I believe the magic of the Parang is in the handle design and the access it provides to wrist action and follow-through. For cavemen like myself, the first notion is to deliver mighty swing power to the target, but I am evolved enough, moderately though it may be, to realize my initial approach was leading toward failure. 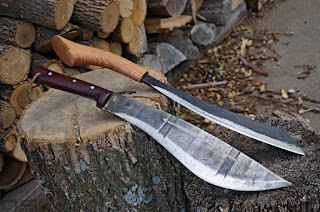 Having watched some people who actually knew what they were doing put machetes and Parangs to use, I knew I had to try something different. My handle is somewhat unique I think, however, I got lucky and made it similar enough to the real thing that it works as intended. With far less arm power, and much more wrist flicking, the Parang laughed in the face of the grass, weeds and brush. It was a lot of fun and the weight to cutting power ratio of the Parang is a formula for reduced fatigue. My Thai E-Nep (seen in some of the pics) is so much heavier and weight forward that it is far more of an axe than machete. It has the power to tackle heavy brush, but would be more tiring when put up against light, thick brush that requires more swings. That brings me to an important design characteristic of the Parang. I have seen them adapted to heavy brush, survival chopping machines with full tangs. I think they lend themselves to that role just fine. However, it is an adaptation, not an improvement and that is an important distinction. I have heard criticism of the partial tang, thinner blade stock, and the methods of attaching the handles. 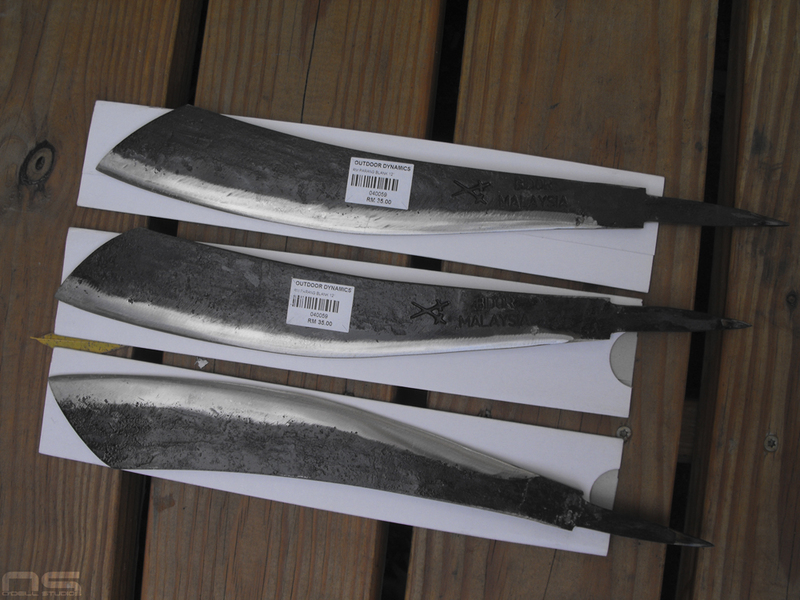 But, just like with the E-Nep, they are different tools and when a Parang is altered to have a thicker blade and full tang, it becomes something else. These Parangs are made from spring steel with the tangs and spines left annealed - they will bend long before they will break, in fact, they may never break. They are also perfectly balanced for the work described earlier. To add a full tang would alter the balance, and to offset that issue, more weight would be added to the blade, creating a much more fatiguing tool to swing. 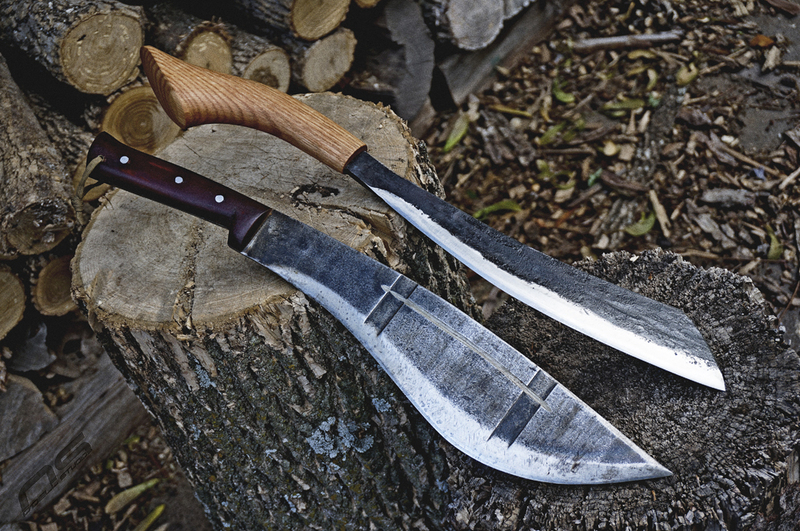 A thick, full tang Parang would be bomb proof, and a powerful chopping tool, capable of performing a variety of tasks that might be appropriate for your environment. 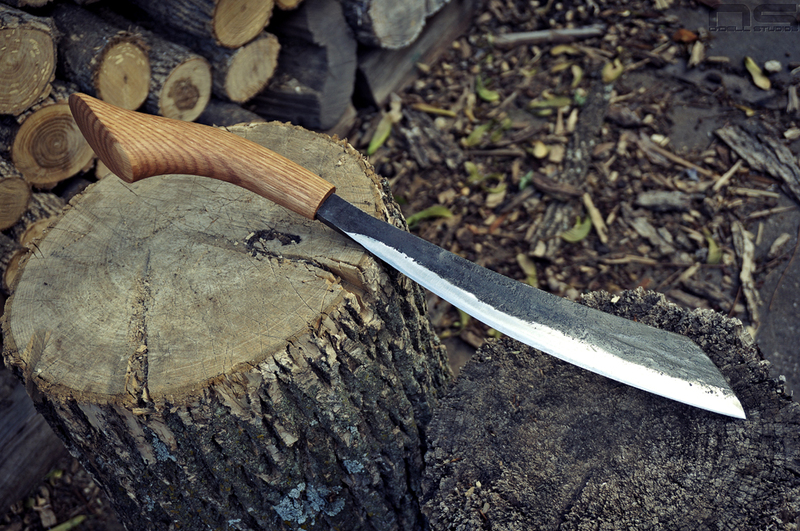 However, this Parang is a remarkably versatile knife just the way it is. With a quick snap it effortlessly breezes through thumb size green wood and is plenty tough enough to tackle more. 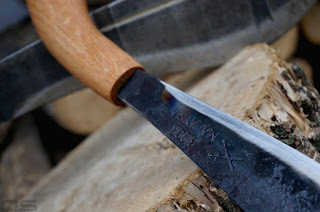 As my readers will know, I am an axe enthusiast and I think they are the original survival tool of the American landscape. 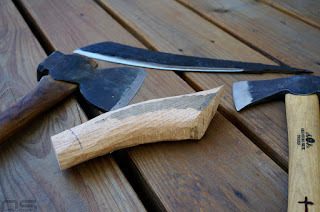 Turning a Parang into a small axe moves it into heavier task territory, but it will never be as good as an axe, and it will come at the expense of all the things the Parang is so great at. This is the problem I see with most heavy, large outdoors knives. In the pursuit of the one tool option, we consistently get tools that are mediocre at everything and good at nothing. In fact, a hatchet, equal in weight to a large, thick knife, is a much more versatile tool (carving and splitting) and an equivalent chopper. And that brings us to the steel itself. Now that I've done some hacking with it and had a chance to put a real edge on it, about all I can say is that I am happy with the steel. The bush whacking I did with it seemed to have no effect on the edge. In fact, the grass and weeds were so thick that I couldn't see what was lurking amongst them and on a couple occasions struck metallic objects which had been discarded there. I think I might have also tangled with a large rock. When it was all said and done I found one miniscule dent in the edge, but overall no loss of sharpness. I would also add that I was cutting and slashing for maybe an hour, maybe less, in the rain. The Parang was wet, my hands were wet, it was pretty much like being in the jungle I think. I was concerned about losing my grip on the knife, but I never did and hacking away in the rain at 70 degrees always beats hacking away in the sun at 100 degrees. The whole adventure was impromptu so the edge was little more than workable at that point, just quickly honed so I could get to work. Once I returned home I put a nicer, sharper edge on it and with minimal effort. I had forgotten about the edge nick, but after sharpening there was no sign of it, after all it was very small. 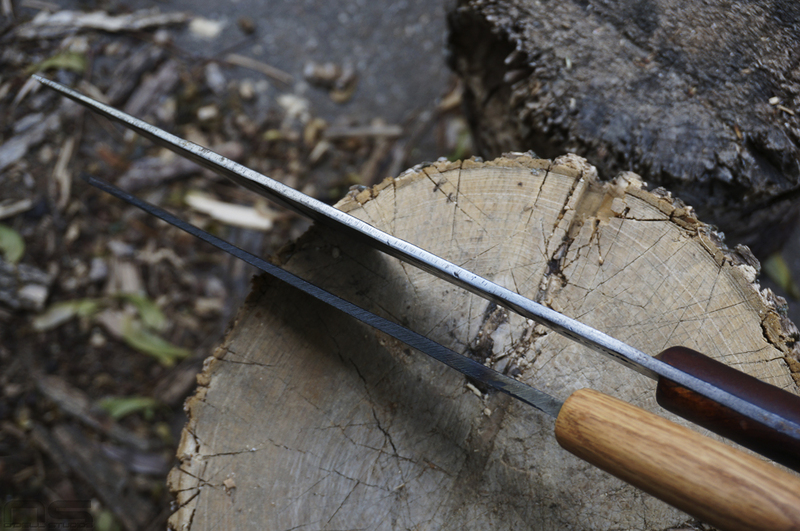 The bottom line is, these Outdoor Dynamic Parangs are excellent, simple, and authentic tools made by people who have been using them for countless generations.